President Bashar Assad has made it plain that American troops should leave Syria and that Damascus is ready for talks with the US-backed Syrian Democratic Forces. Director of US Joint Staff Lieutenant General Kenneth McKenzie said that "any interested party in Syria should understand that attacking US forces or our coalition partners will be a bad policy." "We are there. Nothing has changed. The maintenance of that deconfliction zone is important and we would view very gravely any actions that tended to change that," he told a Pentagon briefing. The statement came after Syrian President Bashar Assad pointed out in an interview with RT that Damascus will continue beefing up its air defenses, saying that he did not exclude another US strike anytime as long as Washington "tramples over international law." Assad also emphasized that even though his government is ready for peace talks with the US-backed Syrian Democratic Forces (SDF), the military option remains on the table. He made it clear that the areas in Syria which are currently under SDF control would be retaken "with Americans or without Americans." "This is our land, it's our right, it's our duty to liberate [these areas], and the Americans should leave. Somehow, they're going to leave," Assad underscored. 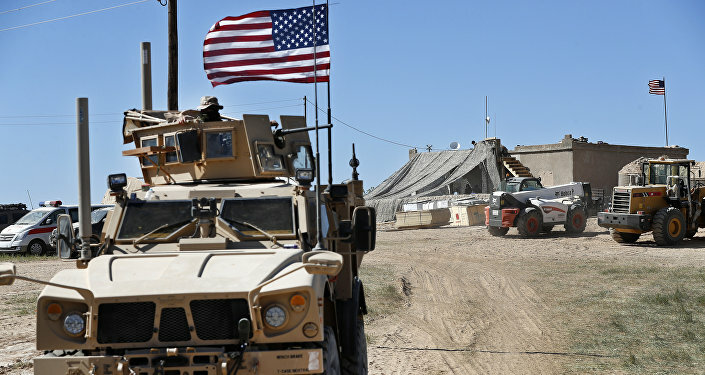 Earlier this year, US President Donald Trump floated the idea of withdrawing American troops from Syria, but senior Pentagon and State Department officials reacted by saying that US troops will stay on in this Arab country. The US-led coalition has been launching air strikes on Syrian soil since 2014, in an anti-Daesh* mission that was approved neither by the Syrian government nor the UN. Right now, an estimated 2,000 US troops are deployed there. Daesh (ISIL/ISIS/Islamic State), a terrorist group banned in Russia and an array of other countries.